There’s not one word on the sleeve that implies the presence of Neurosis on this album, yet every member of the seminal sludgers appears, in some way or other, during this 40-odd minute journey through extraordinary ambient soundscapes. 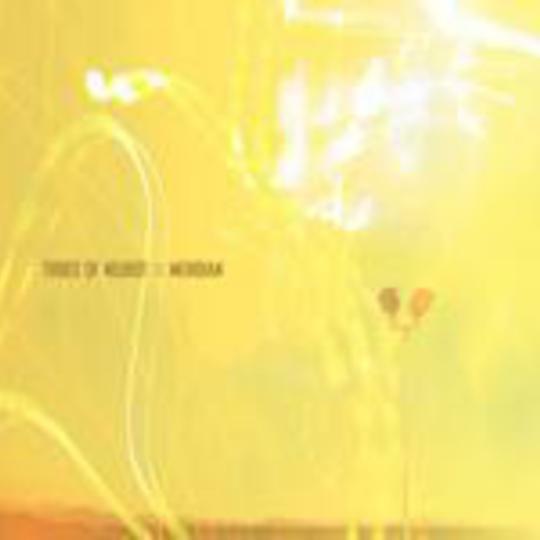 Long-term aficionados will know of Tribes Of Neurot already – this is but one of a series of records produced under the alternate nomenclature – but those stumbling across Meridian in the record store will find few similarities between the groups, even after a swift listening post preview. Whereas Neurosis rely heavily on the heavy, so Tribes… fall upon the understated; where one booms in the obvious places, the other breathes deeply and slowly, steady and relaxed, its menace subtle and slowly evolving. Fuzz-shaped structures are erected only to be battered ‘til they inevitably collapse, hollow shells smashed to dust; sounds from the outermost outposts of the galaxy that we know drift into detectable range only to dissolve into silence, into atmospheric horror-movie shrieks of instrumental distress. Basically, Meridian is a record unconcerned with the compositional rules of contemporary rock – for every step back that Neurosis have taken in their primordially bombastic assault on the senses, their churning rock and drool, this strides some miles further into realms only the wildest imagination knows. That’s not intended to suggest that this is progressive, future-thinking in its design, at least no more so than Neurosis at their best; anything but, in fact. Meridian sounds like a time capsule re-opened after an age underground, strange and otherworldly found sounds pooling and solidifying into crackle-carved turrets and troughs, every alien branch as beguiling as the next, every foreign landscape both inviting and deadly. It’s the land that time forgot, manifesting itself about the ears like a flesh-eating fog. It soaks into your brain and devours it from the inside out. Unlike similarly sombre-paced but synapse-stimulating releases – see many a Kranky-branded LP for an example – Meridian doesn’t outstay its welcome, not that such spine-tingling, utterly strange sounds can ever be invited into one’s home environment with an honest smile. At times it sounds as if it’s choking, spluttering static and distortion forth from a throat clogged; finally it dies, and the skin of the listener feels cold to the touch; something lingers, even some hours after the final fade to black. Meridian is a truly unique listening experience: oddly addictive in its design yet absolutely, addictively terrifying, tenebrous and brooding – like a slow-motion deathblow, a roadside car wreck that’s consumed innocents like cereal flakes, that you can’t help but focus every available sense on, whatever the future cost to your own mindset.